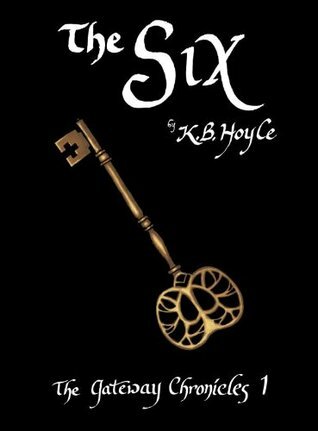 A few weeks ago author K. B. Hoyle contacted me about reading her books. She described The Gateway Chronicles as Chronicles of Narnia meets Harry Potter. Having read Book 1, I agree it has the other worldly feel of Narnia, the magic of Harry Potter, but would add there's a touch of The Last Airbender , too. I really enjoyed The Six . I had trouble focusing on anything else and would often tell myself "I'll just read one chapter" yeah right. I even snuck in some lunch time reading at work and would read snippets while working on publishing house stuff. Within the first few pages I was totally sucked in to the story. I love Hoyle's descriptions at the beginning of the story. which continued throughout the book. She created rich images with her words, without weighing it down with too much detail (which is often a hard balance for an author to find). This series is for young adults and I was pleased that the reading level and subject matter fit her audience while still being interesting to the adult reader. Hoyle does a wonderful job of capture young teen angst. "It took her a moment to remember she was not happy to be there." "Darcy followed slowly behind imagining as she went that she was going to her doom." Ah... the melodrama of being a 13 year old. However, it is this awkward teen that drew me in to the story. I desperately wanted to know what would happen to her, especially with the "energy" she felt on the beach. Is she awkward because she is a 13 year old girl or is there something truly different about Darcy Pennington? I will admit that she almost lost me when we jumped through the gateway and were greeted by mythical creatures. It's not a secret that I shy away from the fantasy genre when reading and the mention of nymphs, dryads, naiads and oreads (the latter three of which I had no clue what they were) had me worried that I wouldn't be able to continue. But, again, Hoyle came to the rescue with aptly placed descriptions of these magical beings. And by this point I was too intrigued with where the story was headed to give up. I really did love this story; there was never a dull moment. When I read the last sentence I was so glad to know that I had the next book in the series to move on to. I might go in to withdraws when I finish The Oracle. I'm already a third of the way through it and hope to share my thoughts later in the week, but at the same time I want to go slowly and savor each passage. 7/7/2011 I'm participating in Review Appreciation Day at The Cait Files. This week's theme is MAGIC. Check out the participating blogs as they share their book reviews. 2/27/2012 The Gateway Chronicles is now under contract with Australia-based publisher The Writer's Coffee Shop. They will be re-releasing the first 3 books in the series starting with The Six on April 5.
oohh, those sound like ineresting books. By the time I get around to reading all these it's going to take me months to get through them all! I have read both of her books, and agree that I think they are amazing! Oo. Sounds interesting. :) if i don't win, i'll have to check these out myself. You had me at "Chronicles of Narnia meets Harry Potter." It sounds great! The narks are fascinating to me. I've never read anything like them! Congratulations on your first giveaway. I am visiting from the Simply Stacie blog team and will be a new follower! I would love to read this story with my kids! It would be so cool to have a signed set of books! I hope you pick me! It sounds really interesting. I am not super fond of traditional fantasy, either, so it takes me a while to give in to reading something like this. I enjoyed both Narnia and HP, so I think I will like this one, too. I'm also new to the giveaway thing, but I have one up now as part of a blog hop - please feel free to stop by and enter. Today (Wed 2/23) is the last day! Awesome review! Chronicles of Narnia meets Harry Potter...I don't even know what to say to that. As a kid I have always had a couple of C.S. Lewis books knocking about on my bookshelf and after a long dry spell of playing lots of video games, Harry Potter taught me how to love reading again. So I will definitely check it out!